The second volume of Fantagraphic's ambitious reprinting of The Complete Peanuts has just hit the store shelves, along with a very fine looking slipcase containing both volumes at a more than reasonable rate, and just in time for making it part of that special comic fan's holiday celebration. So what better time to talk with Seth? After all, not only is he the man responsible for the subtle yet arresting design of these editions, he is also a highly accomplished and celebrated cartoonist in his own right, and a well-known student of Charles Schulz. And the results, as befitting an institution like Peanuts, are presented with attention to detail, simple grace, and enough heart to evoke both tears and cheers from a populace too long-denied these treasures. Bill Baker: One of the first things that struck me about the first volume of The Complete Peanuts was the cover art--a close up of Charlie Brown's head which displays not his smile, or even that put-upon fall guy grimace which has become so familiar over the years, but rather his scowling, almost angry-looking countenance. What lead to your using that image on the cover, why isolate him from the rest of the cast, and is this indicative of what we'll be seeing on future covers of the series? Seth: I was deliberately trying to pick an image that would make the casual readers take a look at the book. The expression, the early (and unfamiliar) features, the slick brush style--they all create a small moment of recognition/confusion. I want the viewer to see the books in a slightly different light than all the other Peanuts books they've seen for the last 40 years. That's why the colour scheme is very low key and the overall design scheme is rather sedate. I want to try and "re-brand" (to use a horrible modernism) the Peanuts strip. Or really, I should say, I want to return Peanuts to the proper branding--which is sophisticated Humour aimed at an adult audience. Too many decades of children's products and marketing has confused the buying audience into thinking that Schulz was writing for kids. I wanted to get away from the bright colours etc. usually associated with Kid's books. Also, I really want this series of books to have some feeling for the sadder human moments of the strip and I hope the overall design of the books (inside and out) will capture some of that. BB: Was it a given that you'd take on the job of designing these books when it was offered to you, or did you have to think about it a bit? Also, I was curious if you had, or perhaps still have, any misgivings about taking on this imposing task? Seth: It was pretty much a given. God knows I can't afford the time a project like this requires (and it will ultimately cut into the working time available for my own work) but who can resist the opportunity to attach themselves to the work of their earliest hero. I honestly want a chance to do something beautiful for Sparky. It is a daunting task in that sense. You have the responsibility of trying to honour the great man with your own paltry skills. You don't want to do anything that will hurt his work. The only thing that makes it easier is that there have been many many horrible editions of Peanuts and his work still goes on unharmed. At the very least, I can't hurt Peanuts. BB: What are some of the other ideas governing your design decisions for The Complete Peanuts, be they imposed by the material and the wishes of its creator and his estate, or generated by your own sensibilities, and how do they manifest themselves in the final look and format of the books? Seth: No one has really interfered with my designs--which when you think about it is a miracle. My main concern has been (as stated above) to try to create a package that will reflect the sophistication of Schulz's work and to try to honour the man's work. I have tried hard to create a package that creates a context for the work. A carefully arranged set of two page spreads (etc.) that lead the reader into the work and then out again. Landscape has become an important element in the design. The books have a simple, austere, interior logic to the design that hopefully should allow enough subtle change from book to book but still keep a very uniform look to the series. BB: Chip Kidd, in his introduction to Peanuts: The Art of Charles Schulz, mentions that material which had been quite familiar was made new for him while working on that book. Would the same be true of your experience with this project? If so, what might some of those new--or newly rediscovered--insights be? Seth: I think I am so familiar with Schulz's work that it would be hard for me to come to it with a totally fresh perspective (even while designing these books). I think that, if anything, working on the first book merely confirmed all my long held convictions about the greatness of Charles Schulz and his vision. He was obviously a man of real depth and it is fascinating to see that depth of feeling evolving in the early work. Certainly, it was a pleasure to finally get to read the large number of early unreprinted strips I have long dreamed of getting my hands on. BB: I think it's fairly safe to say that Schulz's work has had some significant impact upon the whole of comics...and upon your own cartooning, as you've mentioned, as well. What are some of the more important ways that he's influenced the art form? How about your work, whether it be its general content, or design? Seth: Schulz, as my first and longest lasting influence, has affected every aspect of my own work. His drawing and composition skills still continue to affect me if my own work and his writing remains potent today. The strip really was a wonderful and meaningful piece of art. The most profound influence he's had on me (and the world of cartooning ) is as an important artistic example. Strangely, the only other cartoonist of equal value as just such an example would be R. Crumb. Though, seemingly, both from different ends of the cartooning spectrum they both have a lot in common. They both, uncompromisingly, did exactly what they wanted to do. They had a vision and they followed it through unflinchingly. Also, both of them managed to infuse their work with the power of their inner life--taking a medium that is usually vapid and commercial and using it for very personal expression. This sort of thing is a great inspiration to anyone who believes that cartooning can be a meaningful pursuit. BB: What's the best thing about this assignment--and is there any downside to it? Seth: The best part is the opportunity to be the shepherd for Schulz's work--to give it a proper format. The downside is that when the books are done, since I've worked on them, they will always be tainted by my own choices and ultimately I will be filled with regrets whenever I look at them. I will never be able to fully enjoy the books in the way I could if someone else had designed them. BB: What do you get from doing this work, as an artist and designer? How about personally? Seth: The honour of connecting with Schulz's work. I often recall the little boy I was reading those Fawcett paperbacks and think how funny it is that now I get to design the books all these years later. That little boy would have been amazed at the journey from there to here. BB: What do you hope that fans of Sparky's work, be they new or old, get from these books? Seth: For the real fans--I just hope they think the books are nice--that they like them. With new readers--I hope the books help them come to the work with the proper point of view--seeing Schulz's work in the context it deserves. Seth: Two books of my own [were released this past] from Drawn & Quarterly. Bannock Beans and Black Tea--a book done in collaboration with my father about his childhood in the depression, and Clyde Fans book one, collecting up the first half of my current graphic novel. 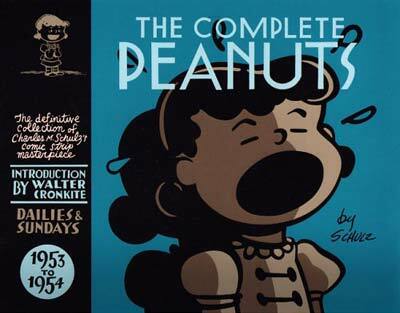 For more information on Fantagraphic's The Complete Peanuts and their other fine books, head on over to www.Fantagraphics.com. For more on Seth's comics, just go to www.DrawnAndQuarterly.com where you'll find his and dozens of other excellent cartoonists' books.